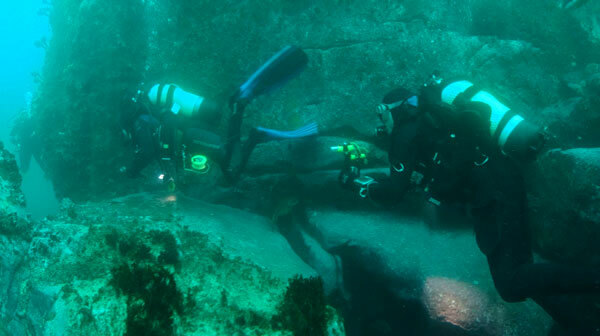 Michael McFadyen's Scuba Diving - Burrill Rocks Caves and Walls Just over four kilometres south of Ulladulla Harbour on the NSW South Coast is a group of rocks that rise up from a sandy bottom. Located a bit under a kilometre off the beach, they are called Burrill Rocks and have given their name to the small seaside village a bit further to the south. A favourite location for holidaying Sydney-siders, Burrill Rocks village is not real big, a bit like the ocean bound piece of land that lies off its beaches. From Ulladulla Harbour, head out to sea and then south. As I mentioned, it is just over four kilometres to Burrill Rocks once you turn south. Head to GPS 35° 23' 45.5"S 150° 28' 13.3"E. Note that most of the GPS Readings on my Web Site are taken using AUS66 as the map datum. If you use another datum you may be about 220 metres off the wreck. See my GPS Page for more details and how to convert readings. There used to be a mooring here but in 2014 it was no longer there. Note that the reef here comes up from over 23 metres on the southern side to about 9 metres or so. Anchor in the 20 metre range if possible. Once on the bottom if you find the depth to be less than 20 metres, head south to the where the reef becomes a broken up series of small rocks with sand in between. You should see it within 10 or so metres. If you are in the right spot you can head north as the main section of caves is in this direction, although there are also a couple to the south. If you go south straight away you will see a cave and tunnel that leds to a very prominent wall. You can follow this for as long as you like or return back to the mooring. 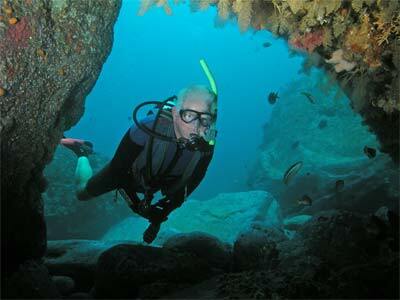 There are a few caves, overhangs and swim-throughs all along this section of reef. There are also canyons that can be explored. To the north of the mooring the depth comes up a bit and you can go as far as you like. The top of the wall is about 9 to 10 metres and you will eventually also come up to this depth if you stay on the bottom. You can also do as a drift dive to the west. 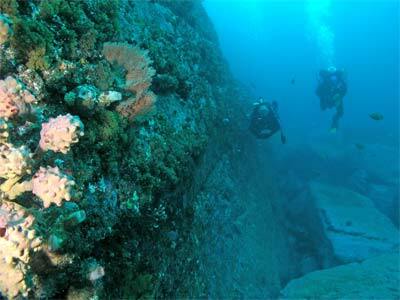 On this dive there are spots where you can swim down a small canyon between the main wall and series of huge boulders. There are numerous overhangs with prolific fishlife. The water is teeming with silver sweep, yellowtail, one-spot pullers, red morwong as well as a few rarer fish (which I will mention later). The many boulders off the wall create swim-throughs and caves, some quite large but most of them only a metre or two wide and a couple of metres long. As you go, you should enter them all, twisting and turning to fit through the smaller ones. You may need to circle around a bit as you go in one cave and exit back "upstream" from where you entered at a spot you may have missed when you first passed. As you enter the caves you will see heaps of eastern rock blackfish, luderick and a couple of eastern blue devilfish. Fantastic! 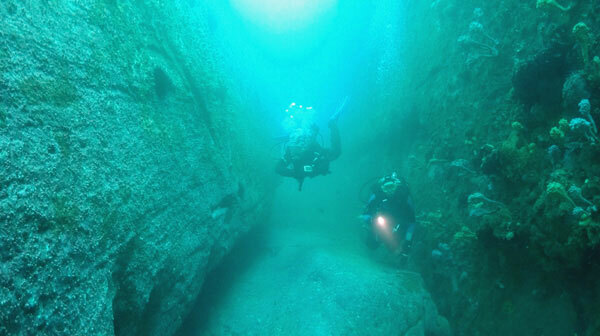 There are more canyons along the wall and you may, like I did on one dive here, quickly spy two very large, and very rare (for both divers and fishers) old man snappers. They were circling over a giant rock and we approached for a closer view. Startled, they took off but soon returned and we got another glance. Magnificent! Near the anchor spot there is an entrance to a larger cave and as you enter hundreds of silver sweep will stream out both the entrance and the exit. This cave turns out to be not very long (with a couple of side and top exits) but straight behind there is another longer cave and at the end of this cave it flows right into yet another cave (although the entrance and exits are a bit tight). In reality, it is one long cave that has many exits along the way. 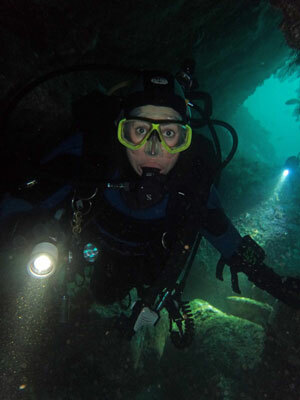 This is one of the best dives I have ever done, with good visibility, caves, heaps of fish and spectacular terrain that even the fussiest diver would have to enjoy.